When you use a person’s likeness, you usually have to ask for permission. But during Jim Crow and slavery, trillions in wealth was stolen from African Americans right in front of their faces, because whites knew they could do so without consequence. When you use a person’s likeness, you usually have to ask for permission. But during Jim Crow and slavery, trillions in wealth was stolen from African Americans right in front of their faces, because whites knew they could do so without consequence. To this day, this wealth has not been repaid. The heirs of the original Aunt Jemima are putting this to a stop in a massive new lawsuit they filed this year. The family is suing for $2 billion dollars, plus a portion of all future revenue for the use of one of their ancestors as the original face on the popular pancake brand. Nancy Green from Kentucky was the first model used for Aunt Jemima in 1890, and her family feels that they deserve to benefit from what she brought to this powerful and wealthy brand. The lawsuit was filed in Chicago by two great-grandsons of Anna Short Harrington. The suit claims that Harrington and Green helped to create the recipe for the pancake mix, which was the first to be able to self-rise. They also say that Green was more than just a pretty face for the cover: She came up with the idea of adding powdered milk to make the pancakes taste better. “Aunt Jemima has become known as one of the most exploited and abused women in American history,” said D.W. Hunter, one of Harrington’s great-grandsons, according to USA Today. Quaker Oats is fighting back. 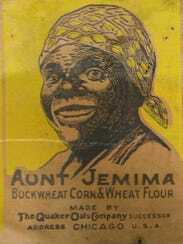 The company says that the original Aunt Jemima was not a real person, but a fictional character they created for the cover of the box. The company also claims that there were no contracts signed between the various entities involved. But the family claims that the contracts did exist, but that they were destroyed. They claim that the company “made false promises to Nancy Green … and Anna Harrington,” according to their lawsuit. They argue that their descendants were promised a percentage of the revenue to be earned by the company. They also present ads as evidence, where a black woman is sharing her “secret” recipe to serve a white family in the south. This suit is similar to another story about Dora Charles, whom Paula Deen referred as her “Soul Sister,” and promised to share her wealth with once she helped her to become famous. It was revealed that, up until recently, Charles was earning just $10 per hour. 1) This story is just one of millions about the vast wealth taken out of the black community by those who maintain white economic supremacy. It also makes a further case for reparations. 2) Economic exploitation of black people continues to this day in collegiate sports, the music industry and the prison industrial complex. So, you should never believe that all of this is a thing of the past. 3) A few ways to rectify this problem going forward is to a) file lawsuits for past and present economic wrongs, and b) emphasis education and financial literacy as pathways to play the economic game on a higher level. The understanding of contracts, business development, etc is critically important to avoid being a victim of economic exploitation.